In medium bowl, beat eggs with fork or whisk until well mixed. In 8-inch skillet, melt 1 tablespoon butter over medium heat. Pour egg mixture into skillet. Cook 3 to 5 minutes, stirring frequently, until eggs are thickened throughout but still moist and creamy. Separate dough into 8 biscuits. Cut each biscuit into 3 strips. Press each piece into 4x1 1/2-inch rectangle. 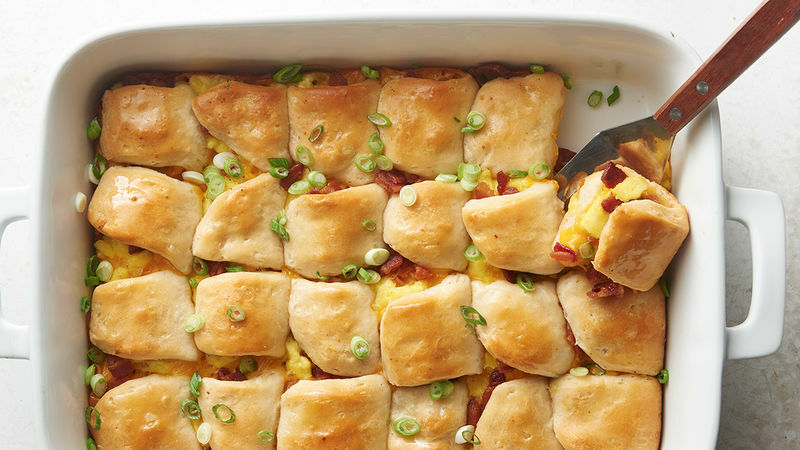 Place 1 tablespoon scrambled eggs, 2 teaspoons bacon and 1 piece cheese on half of each rectangle. Fold dough over mixture (do not seal); place in baking dish in 6 rows by 4 rows. Bake 30 to 35 minutes or until biscuits are cooked through and deep golden brown on top. Brush biscuits with 2 tablespoons melted butter. Sprinkle with green onions. Short on time? Opt for precooked bacon. Or cook a big batch of bacon on the weekend to use throughout the week for salads, sandwiches and more. Swiss, Havarti and Muenster cheeses make great substitutes for the Cheddar.